Will this Japanese arcade stick give you an SNES advantage? 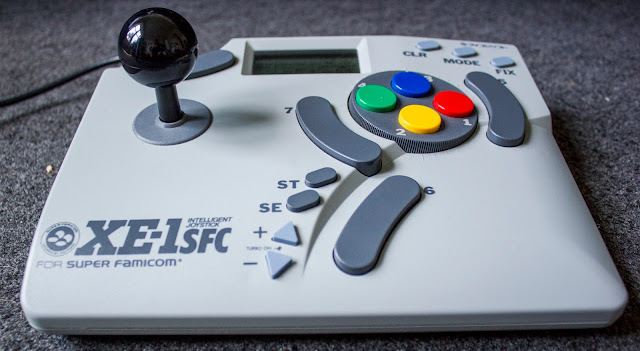 The XE-1 SFC is an arcade stick made for the Super Famicom (the Japanese version of the SNES) by Dempa Micomsoft; a company that made a wealth of accessories for the Japanese video game market back in the 1990's before abandoning the video game scene altogether to focus on video converters and accessories (they're the guys who made the wildly popular FrameMeister). In terms of compatibility the controller will work with any American SNES but sadly you'll have to either modify your console or the controller if you wish to use it on a PAL SNES as almost all PAL SNES consoles feature controller region locking (!). Here's a link for more information if this effects you, I modified my console and it was surprisingly easy to do. But is this stick worth modifying your console for? 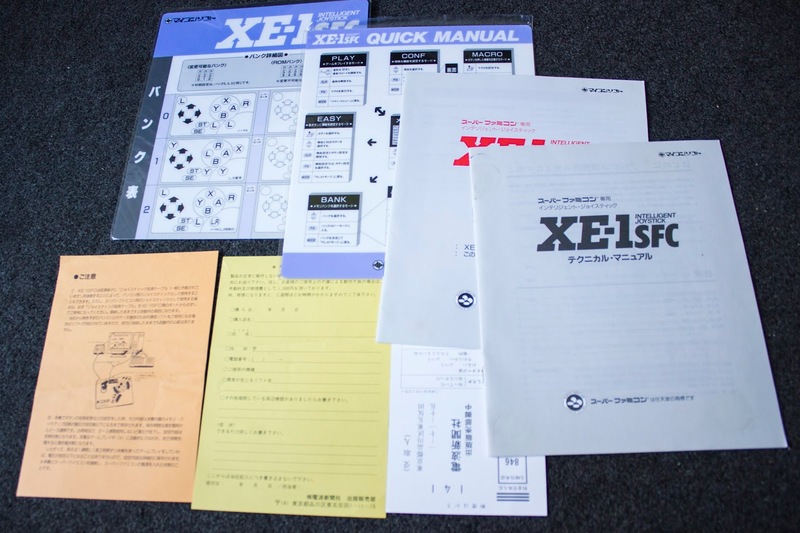 The XE-1 SFC is an unusual and slightly confounding stick to look at with an equally confusing number of features including the ability to rotate the A,B,X,Y buttons, turbo fire, button remapping, stick flipping etc etc... and all the instructions are in Japanese (woo-hoo!). 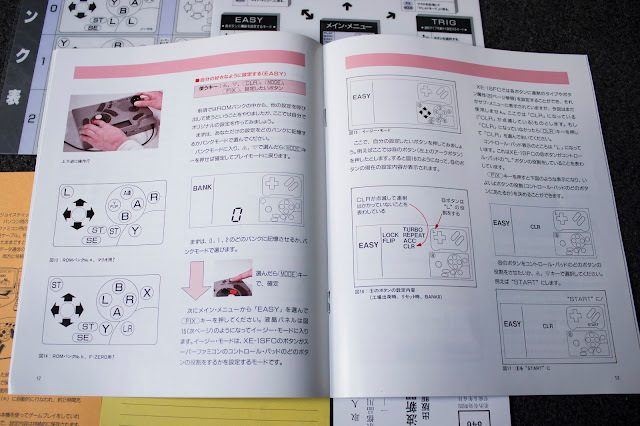 Let us begin by going through the elements that are fundamental to any arcade stick: the buttons and the stick itself. The stick is a traditional Japanese style ball-top locked into a square gate, it features responsive microswitches with that distinctive and reassuring 'clicky' sound and feel. The material the stick and ball are made from doesn't feel premium but it isn't that bad. Little effort is required to manipulate the stick and yet it snaps back into place incredibly quickly. There's little to no wobble when the stick is stationary and the travel around the gate feels somewhat short; all of this adds up to a stick that feels incredibly responsive. It's not loose and wobbly but not too heavy either. I much prefer this style of stick over the more American bat shaped stick which tends to feel very heavy and unresponsive. Unlike the stick the buttons on this controller are anything but traditional, they are probably the most divisive element of the controller. The feel of them is far from arcade-like. The A, B, X, Y buttons have a very light feel, fairly responsive but also a little spongy. The large grey bean shaped buttons that surround the main four buttons remind me of the GameCube's X and Y buttons (did Nintendo get inspired by this stick?? ), their feel is different to the A, B, X, Y buttons in that they're more clicky, bringing to mind the spacebar on an old keyboard! One issue is that the feel between each of these buttons is inconsistent. They are each of a different shape. size and depth and just feel different to one another, the one above the stick in particular is incredibly spongy and not that satisfying to use (thankfully you'll rarely use it). The light coloured Turbo arrows, CLR, MODE and FIX buttons on the top have an incredibly short travel and a satisfying click to them; perfect for navigating menus. The start and select buttons are the spongiest of sponge! Next I'd like to tackle the thorny issue of this sticks' button layout as well as the overall design of the arcade stick. The layout of the stick is so unusual that it's often a fight just to get your brain to work together with the controller, especially if you're playing a game like Street Fighter II which works perfectly with a more traditional button layout. The mismatch shapes and sizes of the buttons make fighting games that use 6 buttons - such as Street Fighter II and Killer Instinct - feel completely alien. Other fighting games like Mortal Kombat fair better as do shoot-em-up's like Super Aleste. The buttons are all rather light and so holding down a fire button for minutes at a time poses no issues whatsoever! The less buttons a game uses the better it will play on the XE-1 SFC, the more complex a game's control scheme is the more it will be distorted by the XE-1 SFC. By default all the grey buttons to the left of the A, B, X, Y buttons correspond to the L button, it's only the one grey button to the right that represents R. This button layout works well as it usually means that your thumb is always over an L, your first two fingers are on the face buttons and your third finger is ready to hit R. Still, the difference in feel, size and shape of the buttons make it all feel a little off. It's an usual and quirky button layout that can make games feel fresh but can also frustrate at times. The size of the XE-1 SFC is much smaller than most modern sticks and will take some time to adjust to for those who've grown accustomed to the larger surface area that the limited edition Mad Catz sticks ushered in with Street Fighter IV. I hold the stick with the shaft between my second and third fingers as can be seen in the left image above. This is fairly comfortable so long as your wrist is coming from below, if you come more from the left your hand isn't going to be supported that much by the stick's base. If you tend to hover above the base then obviously this won't be an issue for you but I found the overall form factor of the XE-1 SFC to be too small. The face buttons are too small and cramped together also and I found that there isn't enough room to truly feel comfortable when using the stick. * Turbo - choose between 1-30 button presses per second, per button. * Repeat - similar to Turbo although there is a delay before the Turbo kicks in from when the button is held. * Acc - continuous Turbo without touching the button. Holding the button acts like the button is being held - for instance you could have auto-fire in StarFox but hold the button to do a charge shot. * Flip mode - changes buttons into on/off flip switches. Press a button and it will be held down until you press the button again. Turbo, Repeat and Acc can be combined with the Flip mode, for example you could have a Turbo fire that is flipped on or off. * Re-mappable button layout - choose any button or stick direction and reassign it to any other button. * Load layouts - load one of 13 Micomsoft presets that are made for specific games and genres. (You can save your own layouts but I can't get my head around this feature). 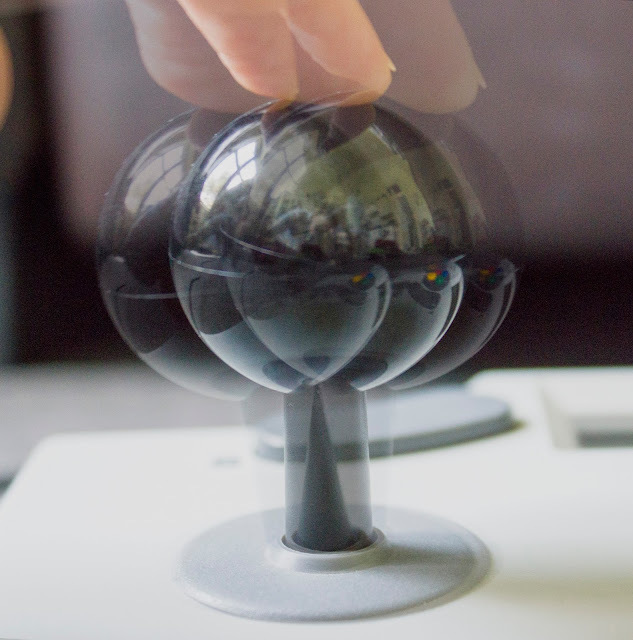 * 4-way stick - disable diagonals for more accurate gameplay in games such as Pac-Man. * Rotate A, B, X, Y buttons - 90° anti clockwise and 180° clockwise. The amount of options at your disposal with this stick is incredibly impressive and it's only when you start thinking about all the wildly different configurations possible that this stick truly becomes something special. Many games do not feature button remapping but you can greatly change the feel of a game by changing around the buttons. For instance you could swap the functions of the stick and face buttons around, you could turn in Mario Kart with the shoulder buttons and accelarate by pushing the stick up. In a shoot-em-up you could have multiple buttons mapped to different rates of Turbo, Flip, Acc fire or a mixture of all the above. You could play with the stick back to front if you prefer to use your right hand with the stick (although obviously this isn't too comfortable!). The XE-1 SFC makes you think about how you play your games and how to customise the stick to get the most out of any different game; it encourages fun and wacky experimentation... but things can soon get out of hand! Thankfully there's a tiny Reset button located at the back of the controller that brings everything back to default if you want to clear the slate and start again. All of this functionality is represented clearly with a simple LCD screen and it's here that you'll be looking when configuring this controller. 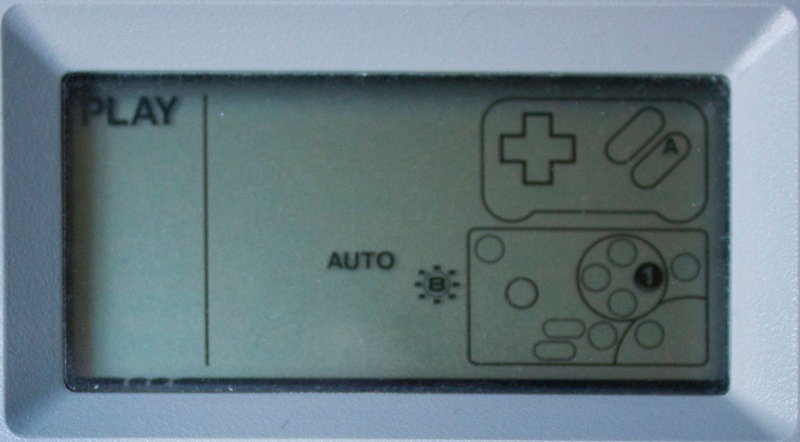 The screen always shows an image of the stick on the bottom right and a traditional SNES controller above. This allows you to quickly see what button you are pressing and how that button is being sent to the SNES. For example you could press button 1 as shown above but have it set to work as R on a controller and so R would be shown on the top image. There are multiple ways of editing the controller which can feel a bit confusing at first but once you've got your head round it it becomes fairly simple. For instance you can quickly add Turbo to a button by holding the desired button down and then pressing the arrows on the Turbo. If you want to clear a button of all Turbo / Flip etc you can hold the CLR button at the top right and then tap the button you want to clear. Adding Turbo on its own is fairly simple but if you want to get into re-mapping the buttons, adding Flip, changing the stick to 4-way etc you're going to have to dive into the menu. There are two ways of editing your controls via the menu: Easy or Trig modes. Each has its uses but visually they look so similar that it's easy to get confused between the two. Easy allows you to work with one button at a time, for instance say you wanted Y to function as an L button with Flip enabled you would first press Y, then scroll through the menu with the arrows until Flip and Clr are both flashing (Clr means you will not have Turbo, Repeat or Acc). You'd then press FIX which will take you to the next stage which is picking what the button represents. At this stage you could simply press FIX and move on to the next button but here we want Y to function as L so instead we use the arrow keys again to cycle through until L is shown on the above controller... then press FIX. When you are happy with your edits press MODE to leave the menu and enter back into Play mode. Editing using the Trig option does not allow you to remap controls but does allow for very quick effects and functions to be mapped across multiple buttons. Say for instance you would like Flip and Turbo at 16 presses a second on A and B buttons you would scroll through the menu with the arrow keys until Flip and Turbo are both flashing, you'd then choose the rate of Turbo by clicking FIX and then pressing the arrows again to choose the desired amount. Then simply click the buttons you want these options to be mapped to (A and B in this case), click MODE to leave the menu and voila! It's a fairly simple system and the ability to clear individual controls by holding CLR and pressing individual buttons or reseting to default by pressing the Reset button at the back of the controller means there's always a way of quickly getting out of a mess. The XE-1 SFC is peculiar and fascinating; it's incredibly odd with its spinning face buttons and bizzare button layout but the controller is also inspiring with its re-mappable buttons and wealth of extra features. The stick itself is very responsive and accurate, the buttons are light weight and responsive but strangely arranged meaning that games like Street Fighter II never feel truly comfortable. The arcade stick is fairly small with little in the way of space to the left of the stick for your wrist which may be an issue for some users. But at the end of the day the fun to be had through re-mapping the controls is unlike anything I've experienced in an arcade stick before, and it's relatively easy to do, opening up the possibilities for creative use and making certain games feel new again. You can negate some of the control issues you may have due to the stick's layout by re-mapping the controls to your liking and perhaps along the way you may end up finding a new way of playing some of your favourite games. The XE-1 SFC is an usual controller and one not without it's flaws but it is also a curious beast that functions well and offers up many new gameplay options for those willing to dive into its menus.